Usually I would wait more than a week between display posts, but there's so much Halloween stuff showing up in addition to the regular non-holiday collections that my image folders are already full again. Really full. Settle in, because I've got even more photos that usual for a display post. I could hardly put some pumpkins in and leave some out, after all. While I do have mostly Halloween things to share today, I want to start with some old business. 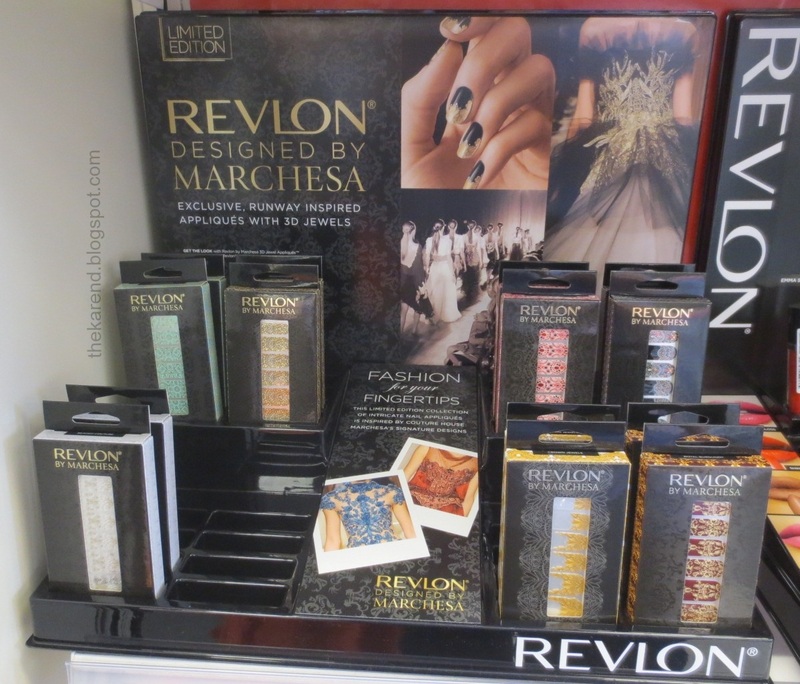 Last time, I said I'd only seen the Revlon Marchesa nail strips at Walgreens, and only in a twirly display. Since then, they've shown up at CVS in a more conventional shelf display where you can see all the designs at once—or you could, if the blue ones weren't already sold out. I've never seen a Nail Bar at a Rite Aid before. 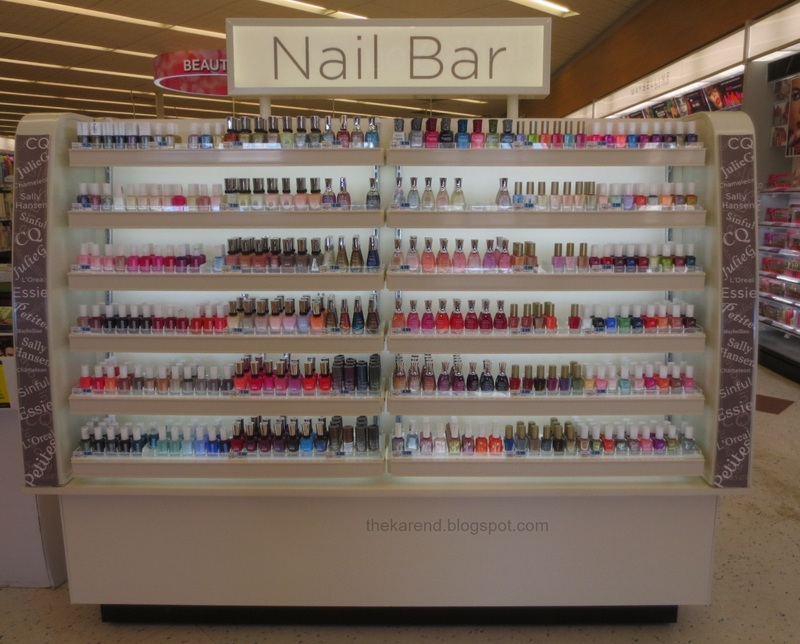 It looks a lot like the displays at some of the Walgreens stores that have a fancier beauty section, a whiter version of a Sephora Nail Bar. Like those, this is lit from behind/underneath, which I don't find as helpful for actually seeing the polish. CVS Nail HQ, which does not have lights in it, works just fine for me. There wasn't anything new in this Nail Bar that I could see, just a new arrangement of core polish lines they already stocked before. This side has Essie, Sally Hansen, Chameleon, L'Oreal, and Julie G. The other side had Sinful, CQ, Petities, more Sally Hansen, Maybelline, and Fergie. 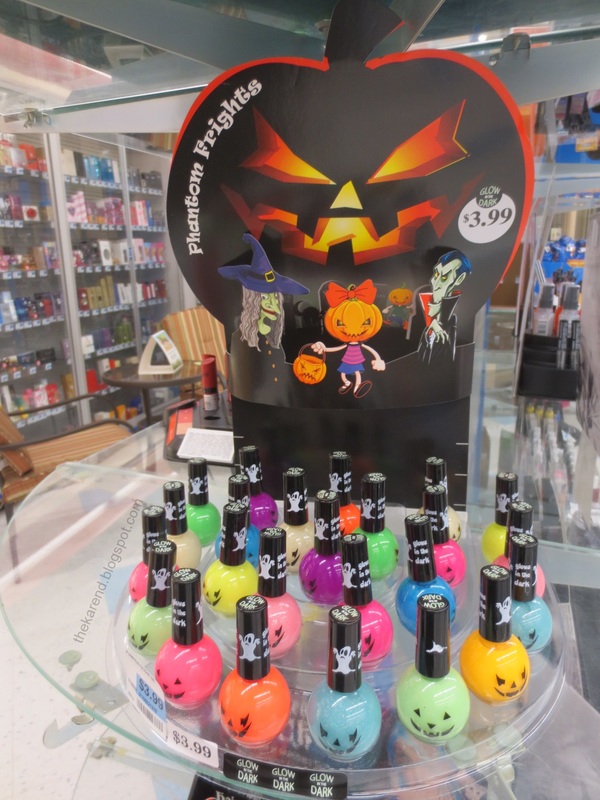 I didn't find any Halloween polishes at Sally Beauty when I went looking this past weekend, but I did grab some more of the Sally Girl matte topcoat (one store had none left, which made me buy even more when I saw it at the next one). I also saw the display for Finger Paints A Pair Affair collection, which was done in collaboration with the blogger behind All Lacquered Up. There are six colors: Our Tips Are Tealed (blue green), Bare No Secrets (peachy tan), Sarong So Right (orange), Sage It Ain't So (dusty green), Yacht To Know Better (dusty blue), and A Grape Catch (dusty purple). My understanding is that these were designed to work in pairs for nail art and accent nails, but the display doesn't really indicate what the pairs are (other than the model is wearing purple and green on alternate nails). Easing our way toward Halloween, Studio M has a fall collection called You Can't Pick Just One with lots of orange and black in it. 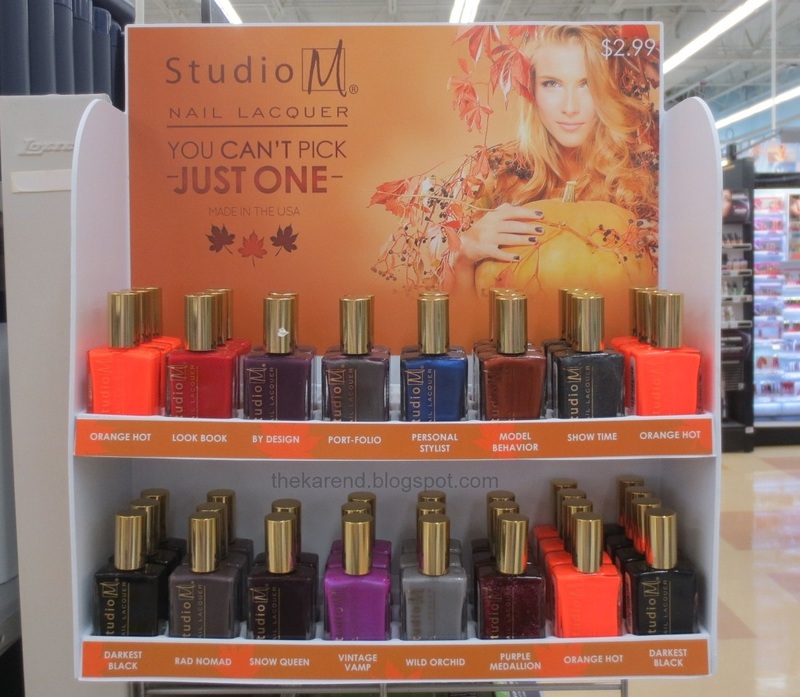 As typical for Studio M, the display has some core colors and some that are new to the brand but not new to anyone who pays attention to Color Club, as many of these are rebottles of colors from the Color Club Fall 2012 In True Fashion collection (and a couple others are from other CC collections). Starting at top left: Orange Hot (core), Look Book (new/CC dupe), By Design (new/CC dupe), Port-folio (new/CC dupe), Personal Stylist (new/CC dupe), Model Behavior (new/CC dupe), Show Time (new/CC dupe), Orange Hot (still core), Darkest Black (core), Rad Nomad (core), Snow Queen (new/CC dupe), Vintage Vamp (core), Wild Orchid (new/CC dupe), Purple Medallion (core), Orange Hot (yep, still core), and Darkest Black (ditto). 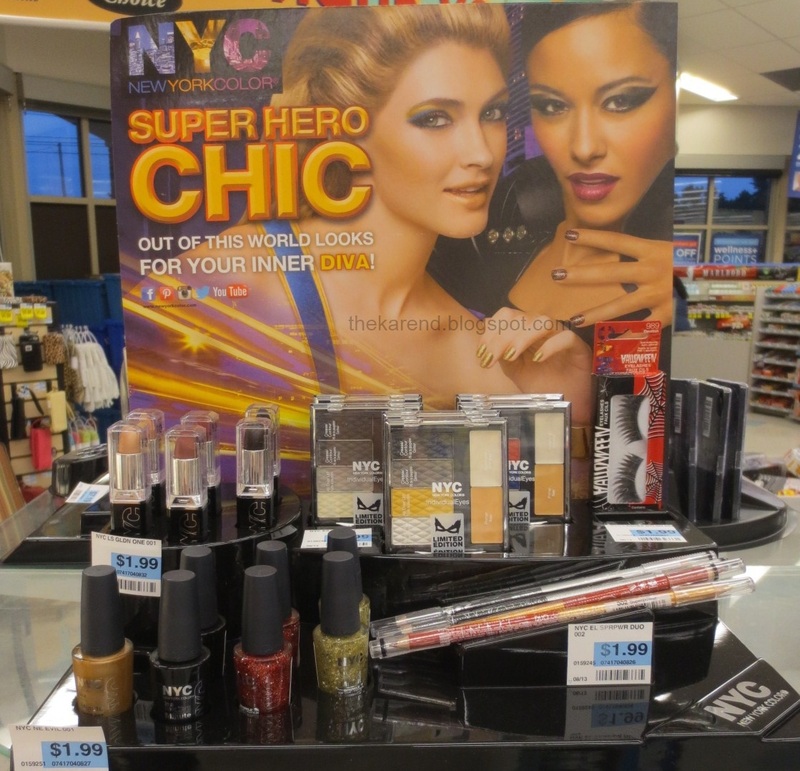 I saw the NYC New York Color Super Hero Chic display at Rite Aid. This has a black lipstick and some false lashes that say Halloween on the package, so I guess this is their Halloween offering. It was in the regular beauty section and not over in the seasonal aisle which must also be stalked for polish at this time of year. There are four In a New York Color Minute polishes here: Virtue (gold shimmer), Evil (black creme), Demon (red/silver glitter), and Angel (gold/silver glitter). 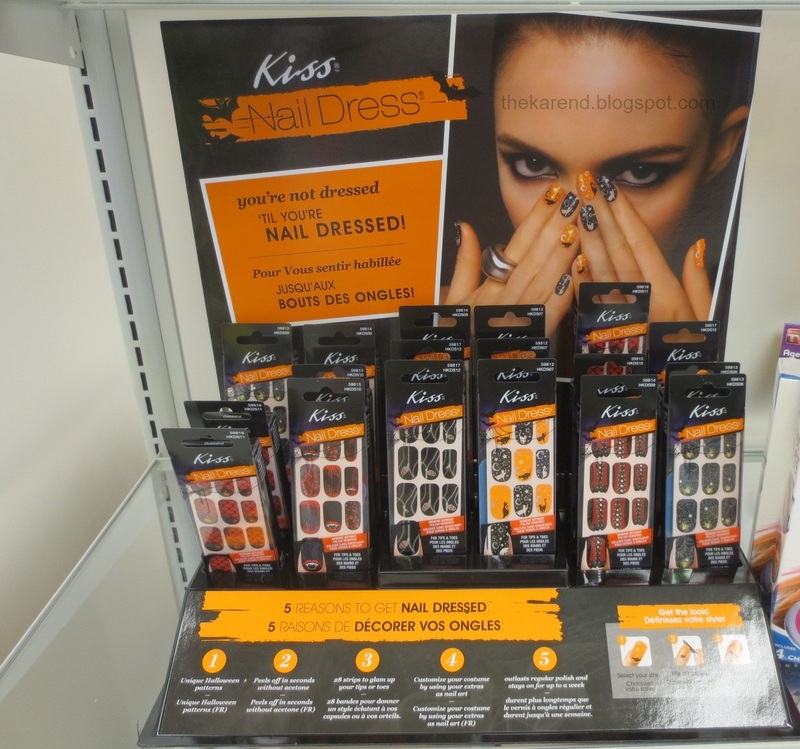 The Kiss Nail Dress was one of the very first full on Halloween displays I saw this year, also at Rite Aid. 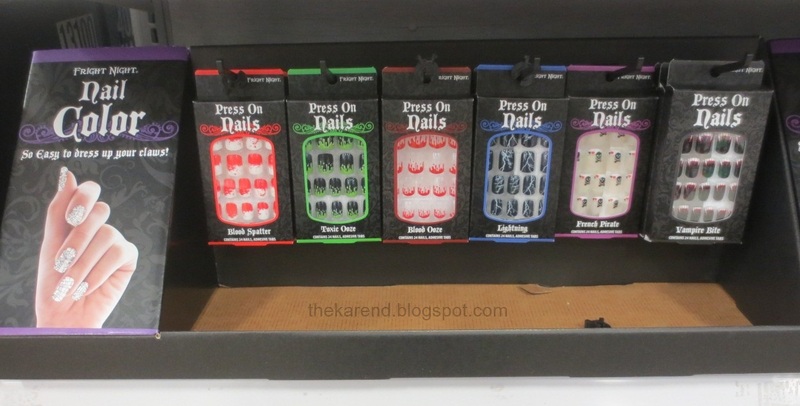 There are six designs of nail stickers here: glowing Jack O' Lanterns with an orange and black skull and crossbones background, red and black with vampire teeth and dripping blood, silver and black zippers with skulls, black and orange cats with stars and moons, red and black corset laces, and yellow/black/silver spiders and webs. Rite Aid also has the imPRESS fake nails. The display touts "Patterns to complete any costume! ", which is true if by "any" they meant "some". There are six designs: a red/black/white that might be blood or might be sky and sea, a blue/silver/black with zippers that doesn't seem especially Halloween since there aren't any skulls on the zipper pulls like there are on the Kiss stickers, black/orange/silver spiders and webs, orange/yellow/white/black bats and spiders and webs and spooky trees, black/red/clear roses funky French, black/silver/clear spiders and webs funky French. Fantasy Makers from Wet 'n' Wild is of course back for this Halloween season. 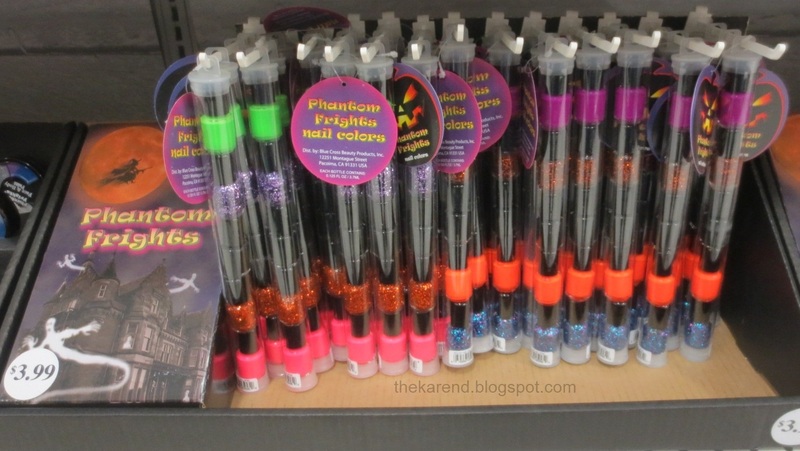 At CVS, I spotted a display in the seasonal aisle that had false lashes and various makeup along with two tombstone nail polishes: Go With the Glow (pale yellow green glow in the dark, same as last year; in 2011 it was called Night Glow) and Darkest Hour (black creme; in 2011 this was called Black Pearl). 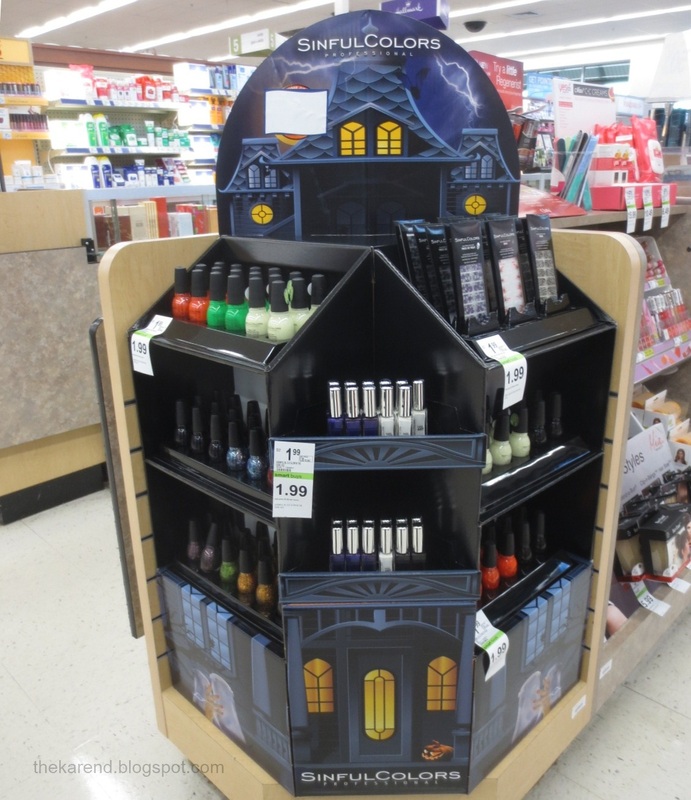 At a different CVS, I saw a different Fantasy Makers display that had four colors of tombstone polish: Darkest Hour, Once Upon a Time (silver foil, which I do not recall seeing in a tombstone bottle ever before), Ghouls Rush In (orange creme, another new to tombstones as far as I know), and Go With the Glow. Walgreens had yet another Fantasy Makers display. This one had no tombstones, but rather core colors from the FastDry and MegaLast lines, plus the return of the MegaLast colors from last year's Pick Your Poison display, which sold out rather quickly around here: Lethal Injection (burgundy), Deadly Dose (gold), Root of All Evil (royal blue), Poison Ivy (deep green), Venomous Vixen (charcoal), and Toxic Apple (deep blurple). 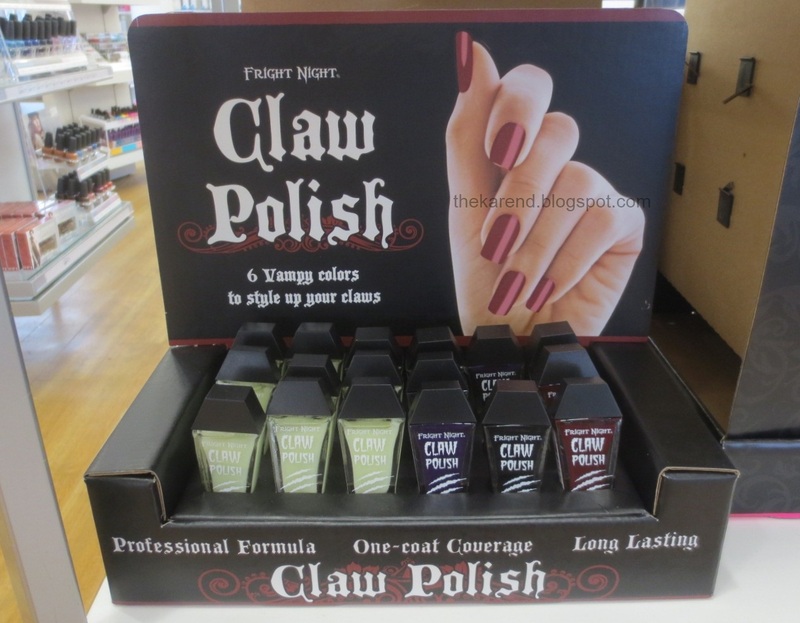 Ulta is the only place so far that I've seen the Fright Night Claw Polish coffin bottles. The display says "6 Vampy colors to style up your claws" but at every Ulta I've been to so far, there have only been four colors in there: Ghostly Glow (glow in the dark), Poison (purple shimmer), Sinister (black creme), and Voodoo (red microglitter/shimmer). I don't recall seeing glow in the dark from Claw Polish before, but the other three colors here are rereleases from prior years. According to the Fright Night website, they also have Wretched (blue), Toxic (green), and Phantom (grey) this year, all colors which we've seen before (though I didn't know the blue was called Wretched). 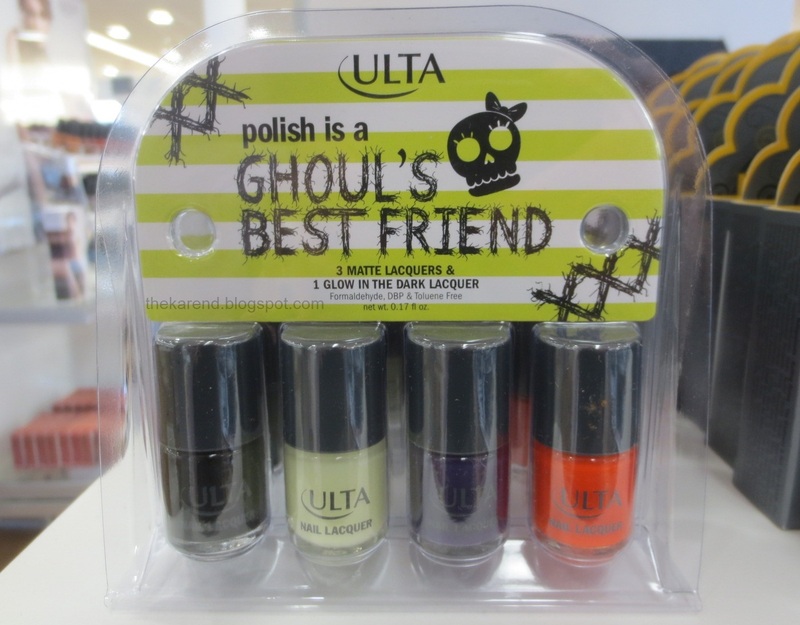 Let's stay at Ulta for a while, as they had quite a bit of Halloween polish. 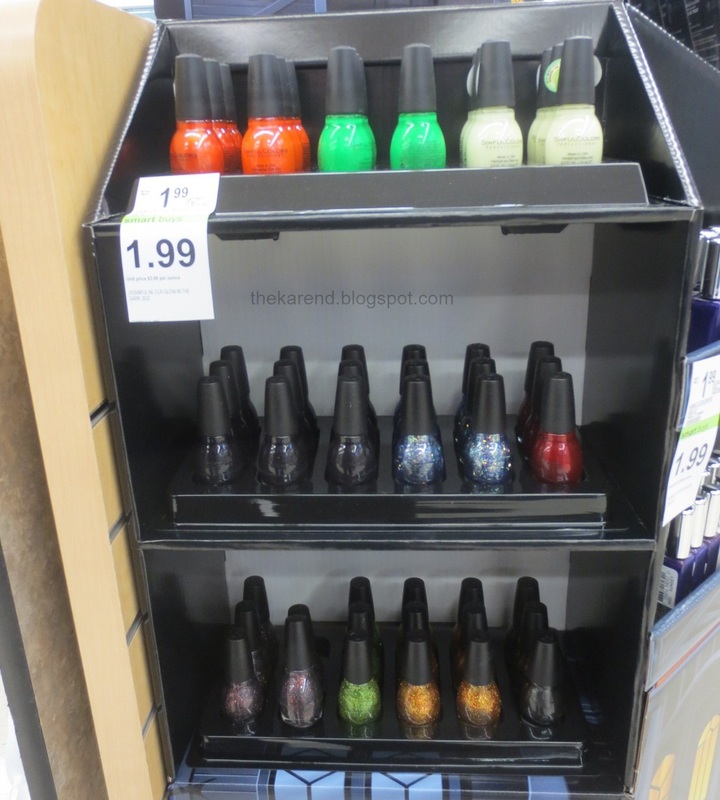 As in prior years, they have a set of four Ulta brand mini polishes. It's called Polish is a Ghoul's Best Friend and the colors are: Witchful Thinking (black), Ghoul's Night Out (glow in the dark), Hocus Pocus (purple), and Orange You Afraid (orange, of course). The color assortment and names are carryovers from prior years, but this year it says the non-glow in the dark ones are matte finish, which I think is new. 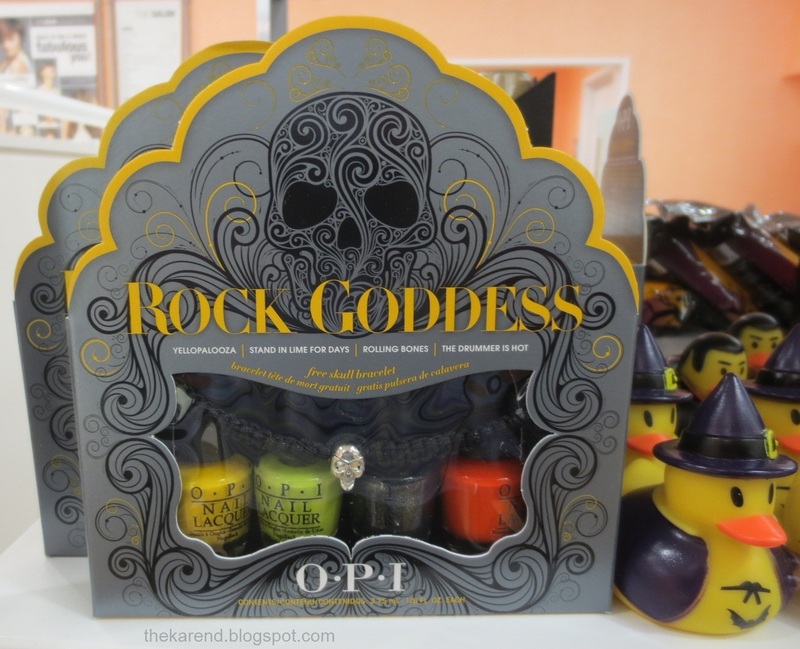 Orly's Halloween display has repromotes in orange and black: Melt Your Popsicle, Orange Punch, Liquid Vinyl, and Goth. 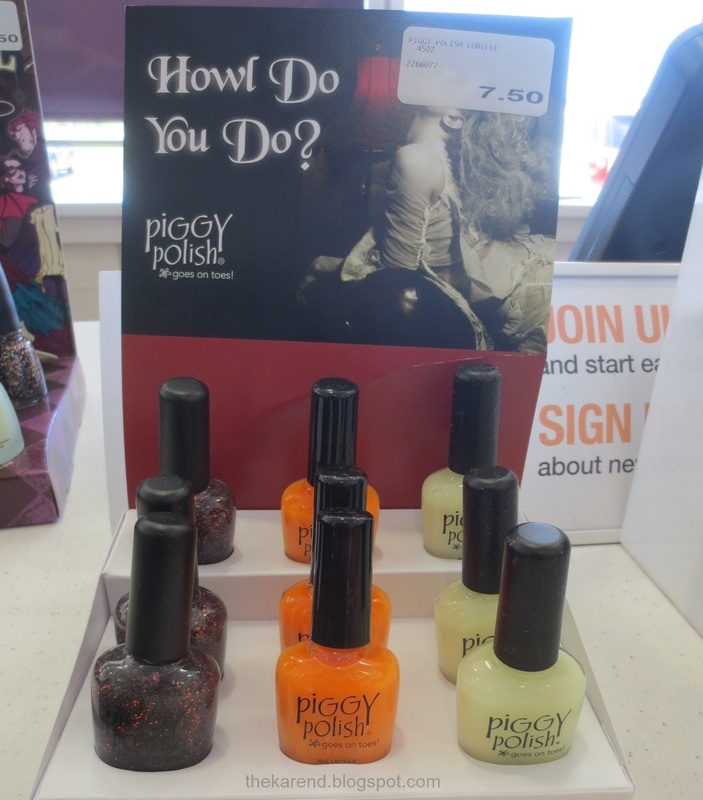 Piggy Polish's Halloween display, Howl Do You Do, also appears to be repromotes, but they changed the names so I can't be sure. Left to right: Fire Burn & Cauldron Bubble (appears to be Lightmare from 2012), How Do You Do (possibly Easy Come Easy Glow from 2012), and Lumiere (almost certainly the same as Nocturne-Nail from 2012). 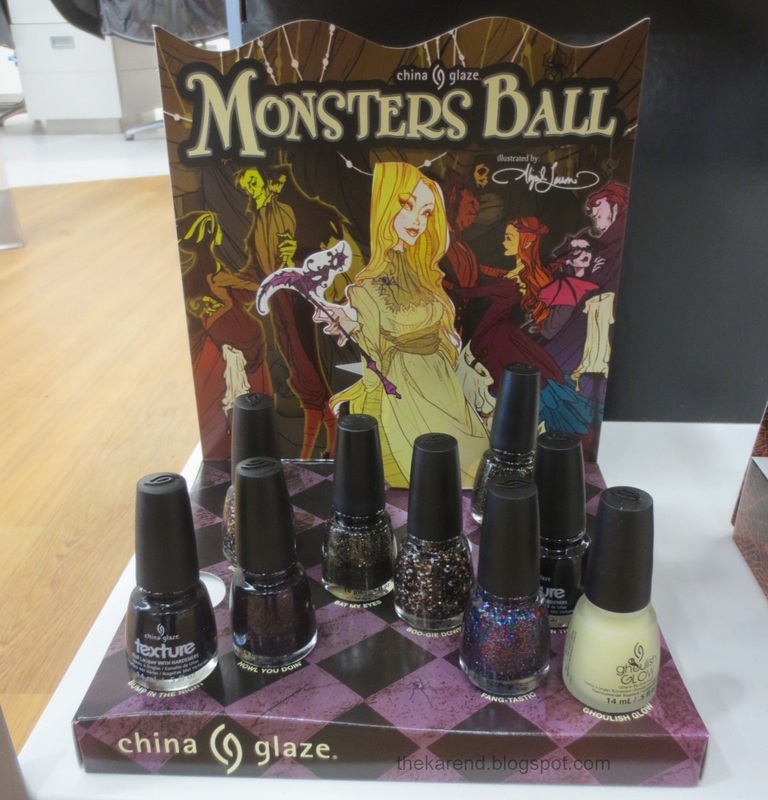 China Glaze, bless them, has come up with some new stuff for this Halloween. Ghoulish Glow, their glow in the dark topcoat, is back, of course. It's joined in the Monsters Ball display by five other colors: Bump in the Night (black textured creme), Howl You Doin' (purple with purple/orange/blue glitter), Bat My Eyes (black with gold glitter), Boo-gie Down (clear with black/white/gold/orange glitter), and Fang-tastic (clear with blue/teal/hot pink glitter). Some Ulta stores have a separate display for Ghoulish Glow by itself. 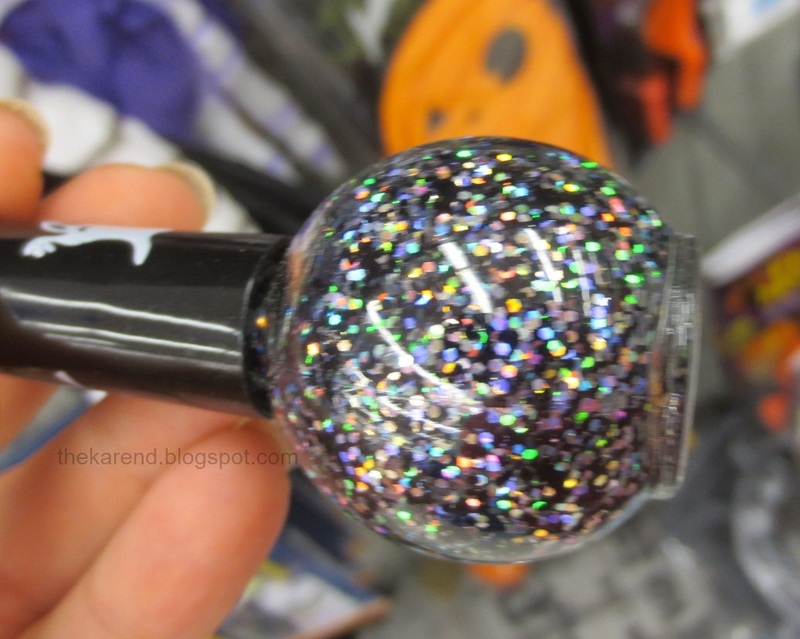 I hope you didn't stop reading and jump in your car to go buy Piggy Polish Fire Burn & Cauldron Bubble just now, because there's a very similar looking glitter in Sinful Colors' Halloween collection, which I've seen only at Walgreens so far. I first spotted it in a corner display with a haunted house look. Most of the polishes and nail art colors here are repromotes, but there are a couple new ones and some nail stickers, which I don't recall ever seeing from Sinful before. The polish colors, starting at top right: Courtney Orange, Citrine, Irish Green (x2), Glow in the Dark (x2, new as far as I know; I sure don't have a glow in the dark from Sinful in my stash), Inkwell (x3), Faceted (x2), Sugar Sugar, Black Magic (x2, new; this is a charcoal and orange glitter that looks very much like Piggy Polish Lightmare/Fire Burn & Cauldron Bubble), Call You Later, Pumkin Spice, Secret Admirer. On the other side of the display, there were more of some of these colors plus snow Me White, Black on Black, and Let's Talk (purple). There are three designs of nail stickers: Trick or Treat (white/purple skulls), Boo (black/orange spiders), and Webs (silver/black spiderwebs). 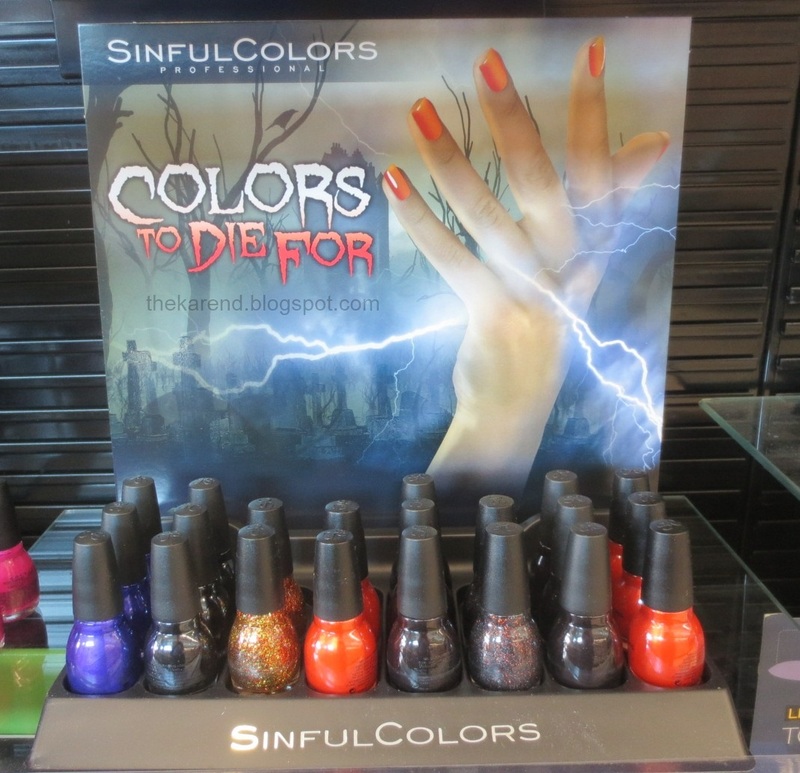 There's also a shelf top version of Sinful Colors Halloween called Colors to Die For. This had these shades: Let's Talk, Black on Black, Pumpkin Spice, Courtney Orange, Inkwell, Black Magic, and Inkwell and Courtney Orange (again). Of course it wouldn't be a proper Halloween without pumpkin polishes. I first saw them in this display at Rite Aid, under the Phantom Frights brand name. These were all glow in the dark polishes, some cremes, some microglitters. As per usual, they don't have individual shade names. I didn't see anything that looked new for this year, but without shade names or bringing my stash to the store to compare, it's hard to be 100% sure. The one I wasn't sure I'd seen before was a black and silver holo glitter; I bought one just to be on the safe side. One thing that was definitely new was the price: $3.99. They were $2.99 last year, and $1.99 in 2011 and 2010. This year they do have ghosts and witches printed on the caps for the first time, but I don't think that's worth the extra money. Some of the same colors as in the pumkins showed up in the Phantom Frights mini sets, of which there were two varieties. Still in the Meijer Halloween section, there were these Fright Night nail wraps. The spider web design shown on the display photo was not in the display to buy. There were six designs, most of which weren't especially Halloween-y, but all of which looked very familiar as they appear to be the same as some China Glaze strip designs: black/white/grey geometric (like ChG Loop Hole), orange/pink fruit slices (Citrus Twist), yellow/brown/black leopard (Ferr-ocious), tuquoise/black zebra (Seeing Stripes), lime/yellow/brown plaid (Kickin' Up My Kilt), tan/brown snakeskin (Sneaky Snake). Fright Night also has Press On Nails. These were more Halloween-esque designs than the strips: Blood Spatter, Toxic Ooze, Blood Ooze, Lightning, French Pirate, Vampire Bite. 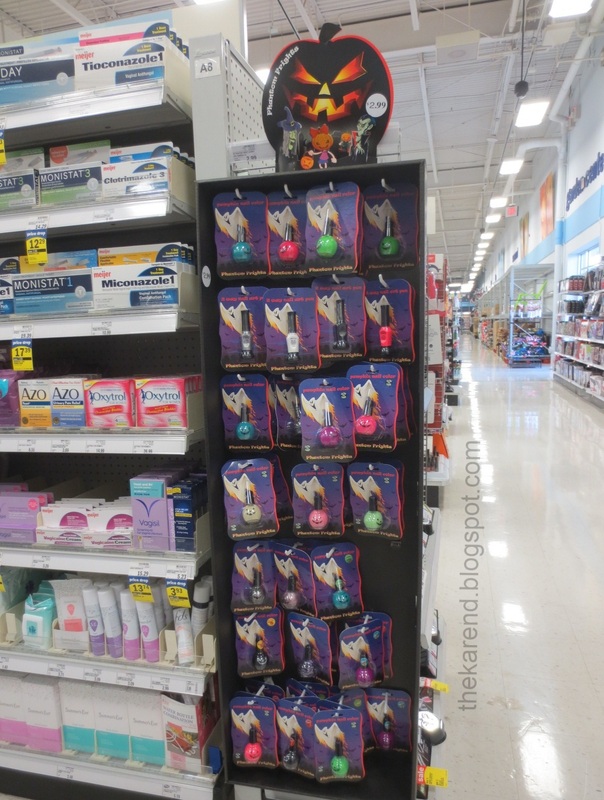 There was a Kiss/ImPRESS display with some of the designs from the full displays we saw earlier at Rite Aid plus some Kiss decals with ghosts and spiders and other Halloween images. 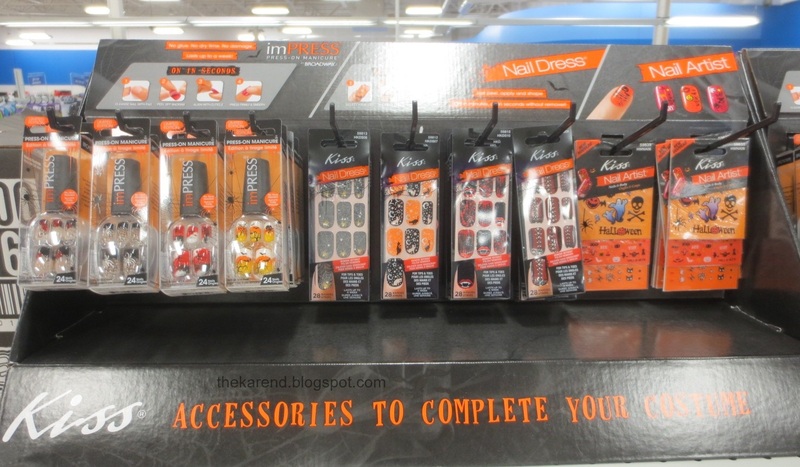 In addition to all the pumpkins in the shelf displays in the Halloween section, Meijer also had a sidekick in the health and beauty section with pumpkin polishes and nail art pen/polishes in individual packages. At first I thought these were just the same ones seen elsewhere, but no, some of them were scented. I don't believe I've seen scented pumpkin polishes before. These were all fruit scents, I guess like the candy one might get while trick or treating. 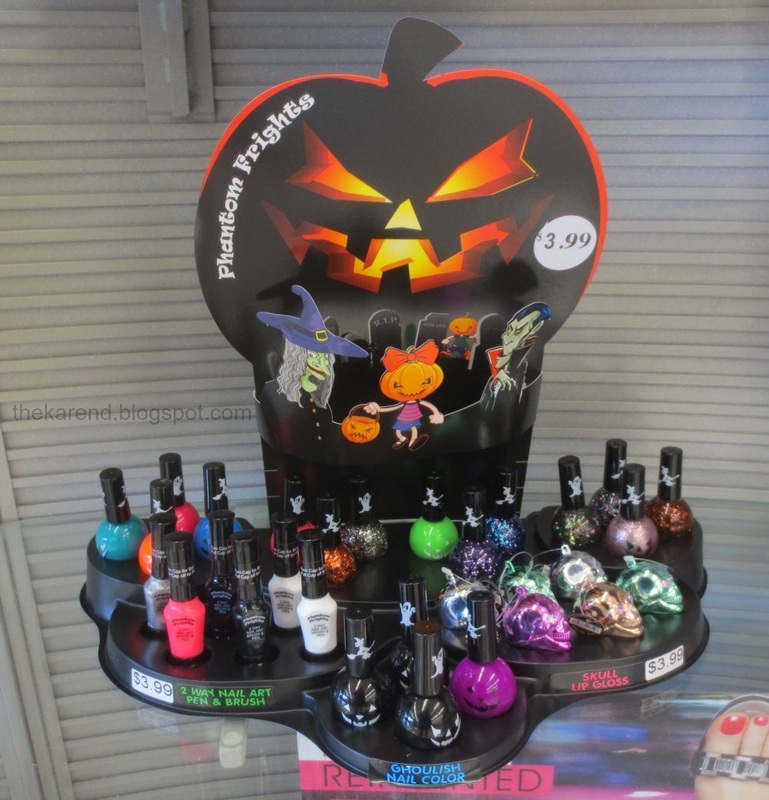 You'd think all this Halloween stuff would be enough holiday polish for a while, but no, Rite Aid put out the Wet 'n' Wild Fergie Holiday 2013 display despite Christmas/New Year's being so very far away still. There are slots for seven colors here, and there were seven different shade names on the backs of the bottles, but I could see no difference between the first two. Left to right: Graphite Greetings (I strongly suspect this is a mislabel, as this is not graphite in any way), Happy Holidaze (looks just like the one called Graphite Greetings), Black Metal Magic, Mazel Tov Madness, Emerald Rock City, Mountain High, and Titanium Crush. One more display and I'll let you go (assuming you've made it this far). 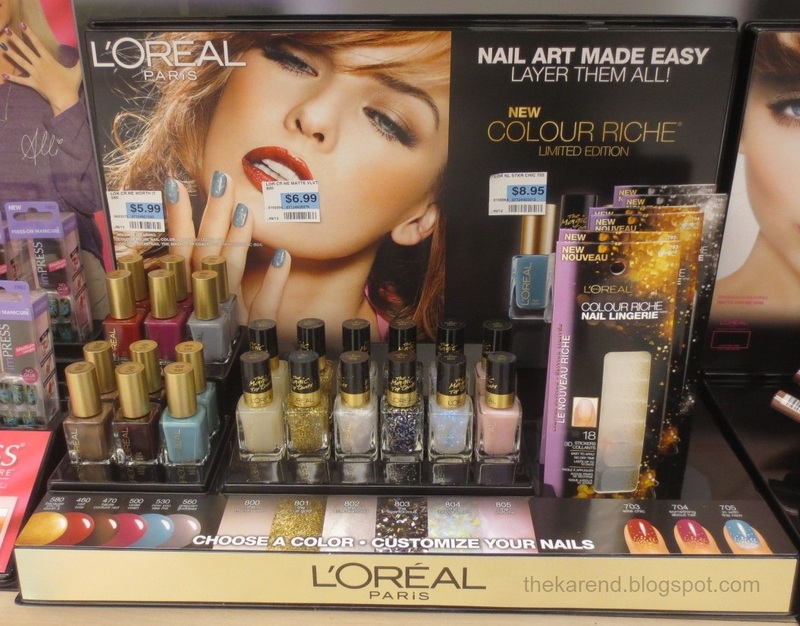 Rite Aid also put out the L'Oreal Nail Art Made Easy display which doesn't say "holiday" on it but sure looks blingy like winter holiday displays often do. This has the six core colors of polish, three Nail Lingerie sticker designs, and six Magic Top Coats. The polish colors are Because You're Worth It (gold), Haute Couture Red (dark red), Now You Sea Me (turquoise), Red Tote (red), Violet Vixen (fuchsia), and Greycian Goddess (taupe). The Nail Lingerie designs are Elite Chic, Something About Her, and In With the New (same ones as are in the Mix and Matte display now and were first seen last winter). The Magic Top Coats are The Matte Velvet (matte topper; you know I bought this immediately), The True Gold, The True Diamond, The Sparklicious, The Holographic (not holo; it's flakies/shreds), The Shift Me. Whew, I'm exhausted. Hope I didn't overload you all too much with this shopping trip! Wow how many awesome halloween displays... here in sweden it's so bla-ha.. nothing like the stands you photograped, and when I say nothing I mean totally nothing. nickeeschickee, send me an e-mail (the.karend @ gmail.com) and I'll fill you in as best I can. The Loreals look so pretty! Wow that nail bar looks awesome!